Though traveling to Thailand is commonplace for Europeans, most North Americans consider it too far away and even too exotic to visit on a regular week or two-week vacation. That’s a shame​ because if you can get past the 14-plus hours on a plane, Thailand is a mind-expanding vacation destination. Although it’s always better to visit if you have weeks or even a month to spare, you’ll also get plenty out of your visit if you go for just a week or 10 days. The dollar goes a long way in Thailand. There are hundreds of hotels and guesthouses available for prices that sound like America in the mid-20th century. Thai food is likewise inexpensive, and often the street food vendors, who typically sell dishes for what Americans consider pocket change, offer the most delicious stuff. Want to splurge? That's even better because Thailand has some outstanding hotels and resorts, all for significantly less than you would pay back home. Thailand has some of the best beaches in the world: warm, clear water; stunning vistas; and marine life to gawk at as you swim, snorkel, or scuba. Plus there are so many different types of beaches in Thailand, from quiet and laid back to party all night, that everyone can find the perfect fit. Few will argue that Thai food isn't delicious. But if you’ve only been exposed to it at Thai restaurants in the United States, you’re in for a surprise. Here in Thailand, the food is better, there is more variety, and it’s very inexpensive. You’ll easily find favorites such as Thai curry, but you’ll also find a wide selection of salads, noodles, and snacks. And believe it or not, with apologies to the American South, Thailand has delicious fried chicken. If you like markets, bargains, or cool and quirky stuff, you’ll find shopping in Thailand rewarding. Big city markets carry everything from shoes to art, and the malls in Bangkok are some of the fanciest in the world. They don’t call it the “Land of Smiles” for nothing. While there are occasional tourist scams and once in a while, you’ll encounter someone who isn’t smiling, by and large, the people of Thailand are friendly, open, and kind to foreign visitors. Buddhism is Thailand's predominant religion, and it influences everything from the architecture to the way people interact with one another. 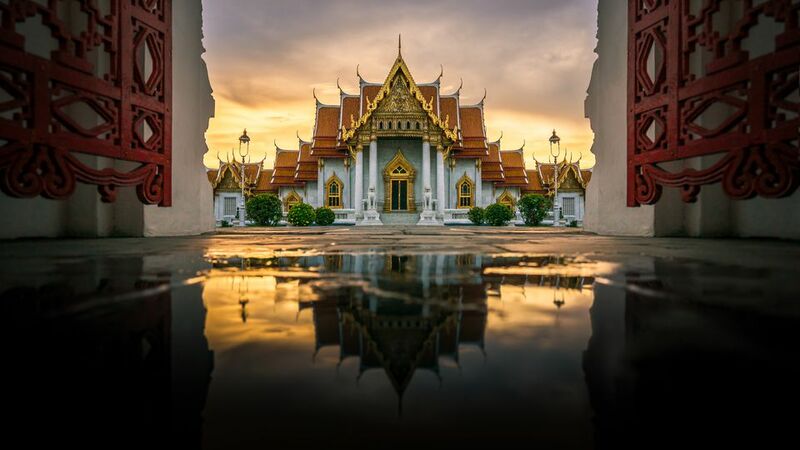 All of the country’s major cities have breathtaking Buddhist temples to visit; Chiang Mai and Bangkok have the lion's share.